Any Given Sundry Too – Look. Something beautiful. Every day. 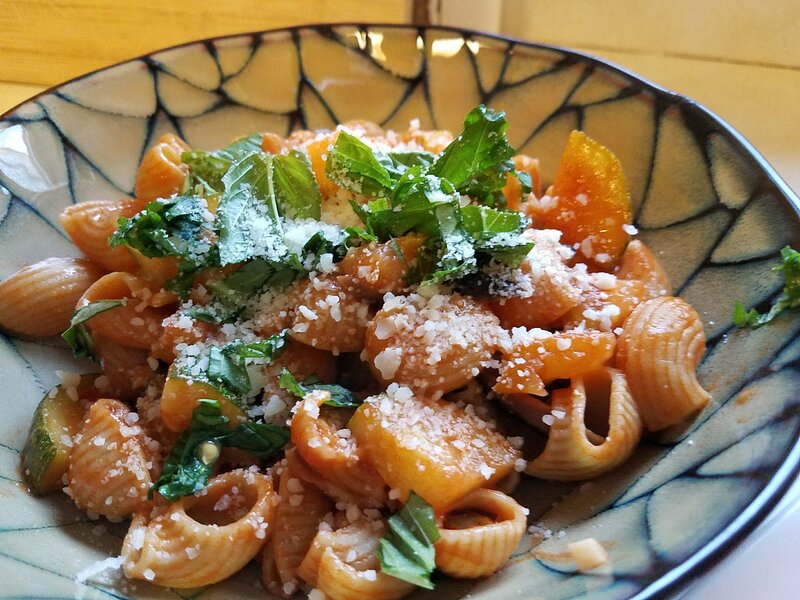 Blue Apron Experience – Thumbs Up! 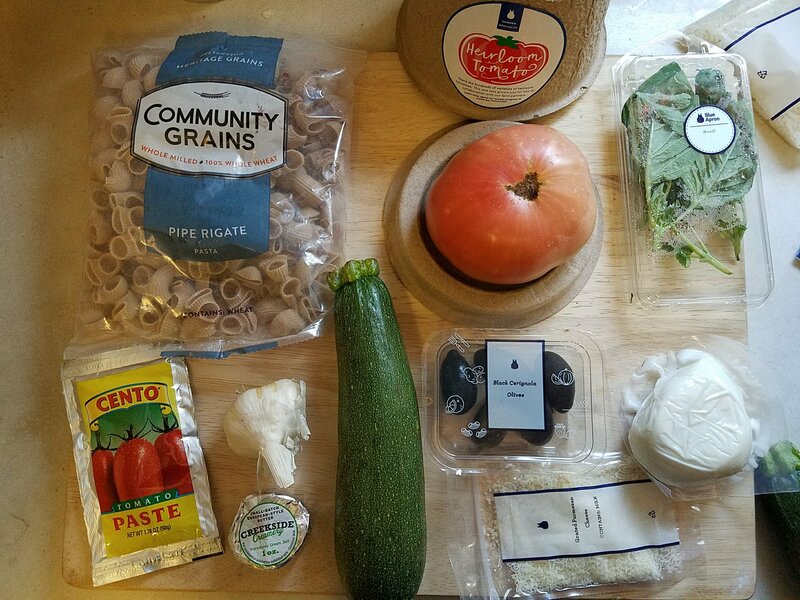 After two consecutive weeks of Blue Apron deliveries I have to say that this was fun, challenging, and I learned a few things. This was actually the last of the three meals in my first delivery, but I’m posting the photo first because it was my favorite meal. Really delicious. I ordered the two-person vegetarian box, which means I received three meals designed to serve two people each. I soloed on this culinary trip, so I actually had 3-4 meals per dish. Nice! Also, the ingredients are really superior. 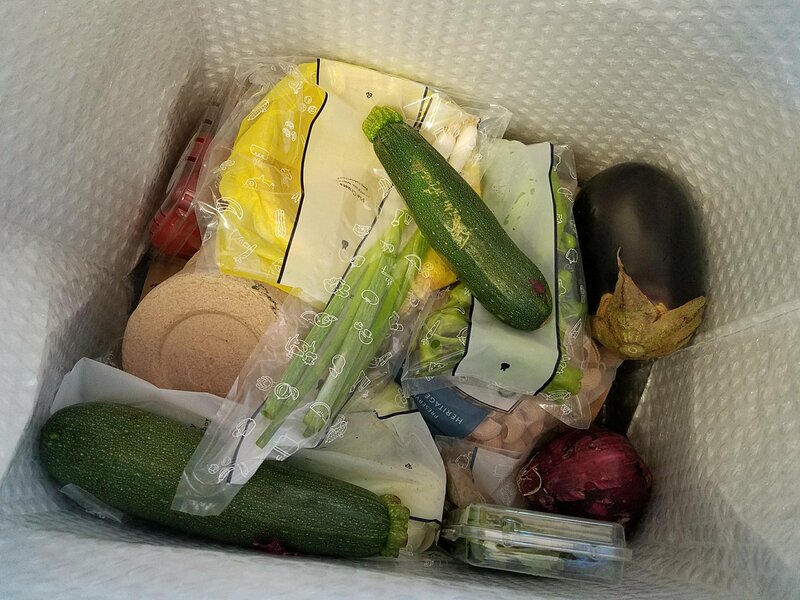 The only problem was that some of the fresh items, which I know could last longer if I purchased them myself, arrived spoiled or spoiled before I could use them. Also, I substituted my own brown jasmine rice for their white. Be prepared to use all your prep bowls! To keep the time down, the instructions have you prepping everything ahead. I do this myself, but somehow I usually manage to clean as I go. At the end of every cooking session, my kitchen was trashed like the set of the tween-cooking episode of a sitcom. Mostly, I managed to keep my cooking times to the estimates on the well-orchestrated recipe cards. I actually made these for breakfast on Saturday and had the leftover one on Sunday. The crusts were fabulous. I really wanted to stick to the recipes, so I didn’t doctor this up with herbs like I would have, and I found it a bit bland. Plus, half the cherry tomatoes had escaped into the shipping box, so it wasn’t as tomato-y as it could have been. I didn’t make the side dish of zucchini and corn because it’s a lot like something I already make. Those are fairy tale eggplants on the upper left. Wow, they are darling, and they cook up nicely. My second box arrived the next Friday, and I didn’t have time to cook that night, so I made the pizza for Saturday brunch. The mozzarella was amazing. Pulled apart in milky shreds. I had to sample some before putting it on the pizza. The zuchinni and tomatoes were for the side dish of blistered tomatoes, zucchini, currents and white wine vinegar. My least favorite dish, but interesting. I wished I’d saved the tomatoes for later. They were delicious on their own. I was surprised that the small amount of tomato sauce that adhered to the slices of eggplant made for such a satisfying distribution of flavor. 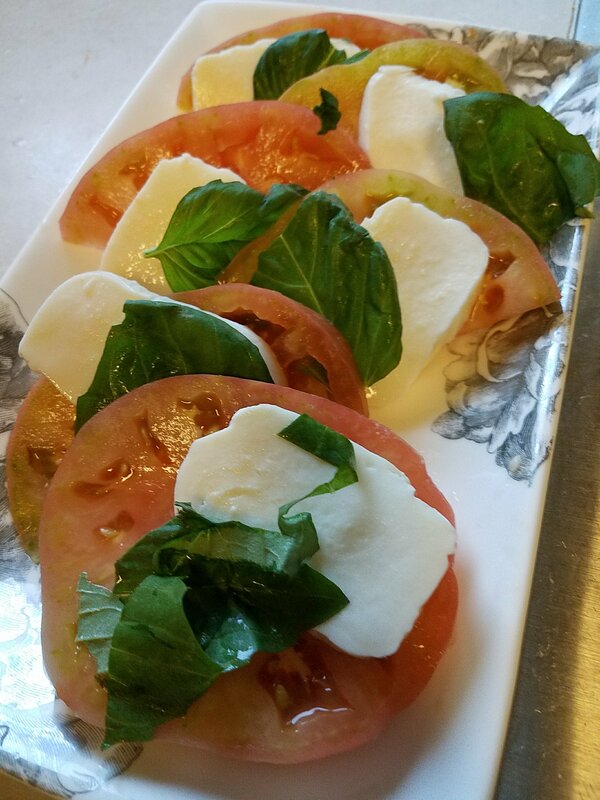 Fresh basil, how can you go wrong? This was a four-meal dish. This was another of my favorite dishes, although I omitted the egg when I had the leftovers (twice!). I am usually a big fan of a hot meal, but this was really good. I’m glad I had the experience of cooking and chilling the ramen noodles (by simply rinsing in cold water). Not difficult, I just probably wouldn’t have tried them cold. The dressing is easily reproducible, but involved two tablespoons of white sugar, so I’ll come up with an alternate for that. This recipe prompted some pondering about what exactly makes something a salad. Seems it is pretty much a wide open category. Doesn’t even have to be chilled. This salad and German potato salad are good examples. I liked this dish pretty well, but by the time I got around to making it (Wednesday), the cherry tomatoes were inedible, so I scavenged a few from my ramen leftovers. The goat cheese was maybe the best I’ve ever had. Creamy and amazing, and it was hard to do as instructed and add white wine vinegar to it to stretch it. I would do it with a lesser goat cheese, but not with this goat cheese again. I enjoyed being reminded how worthwhile it is to blanch and shock green beans. I mean, really. Fabulous. And that eggplant isn’t all that mysterious. And that just cooling my jets while the veggies brown without being stirred is a very good thing. Also learned how to deal with panko breadcrumbs. Duh, right? I could have looked it up online a million times, but I never thought it was worth it. It was worth it. 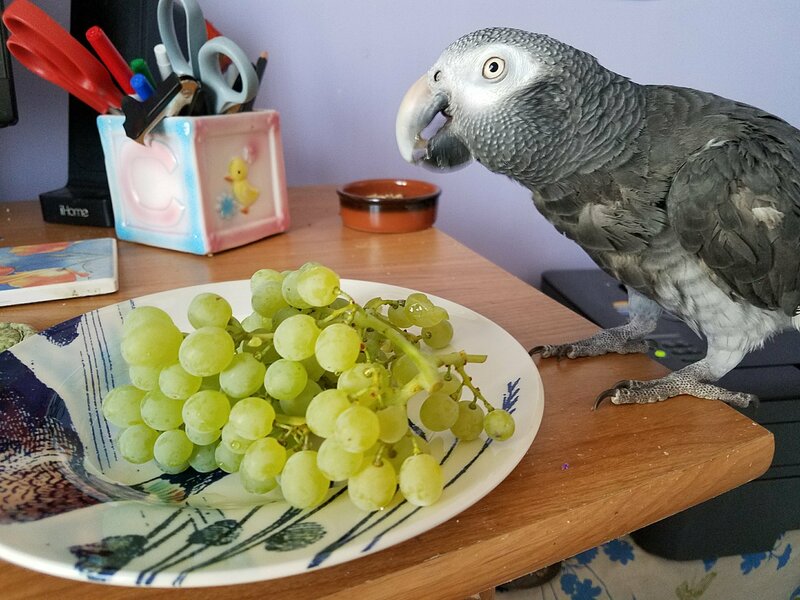 Delicious topper to this odd dish. So, yes, this was a lot of fun. A bit of pressure because of the boxes arriving late on the Friday afternoons of busy weekends. If you’re a complete novice, I’d say do this, but with a partner. It’s a lot on your own. If you’re experienced, it’s nice to be reminded that going the extra distance (like toasting cashews with herbs and lime zest for first eggplant dish) is really worth it for guests. And maybe for yourself, too! Sadly, I won’t be sticking with the club on a regular basis because I try to eat whole-food-plant based, which doesn’t include all this oil and dairy. There was only one egg and dairy free meal out of the six. I know, that’s a lot to ask! Tasty as it is…too much cheese. It’s Friday, and I’m not getting a box of fun things to cook. But Blue Apron is really nice about it and they will let you start and stop your subscription pretty easily. You can select meats, fish or veggies and you can opt out of types of meats you don’t want. I will probably order another veggie box when I have visitors coming, just to up my game! Yeah, I admit it. I’m jealous of my many friends who are exiting north in search of the total solar eclipse that will sweep across the U.S. on Monday, August 21. Indiana people, check out the map! You’ll get about 86% at 2:24:37 in in Whitley County. But it will be 100% in Paducah, KY. 4 hours from Bloomington! Okay, still quite a commitment. Use this cool program from Vox to find out what it will be like where you are. Here’s NASA’s map. My good friend, Treacy, sent us an anniversary card with this amazing USPS stamp on it. This is as close as I’ll get to the totality. But I’ll be outside on Monday at 10:21, you bet. Dana pushed the video button on my phone and Dodger provided the creaky sound effects by sneaking into the kitchen cupboard while we were both occupied. Group effort! If you go, you know I want to hear all about it! Anyone else curious about this? 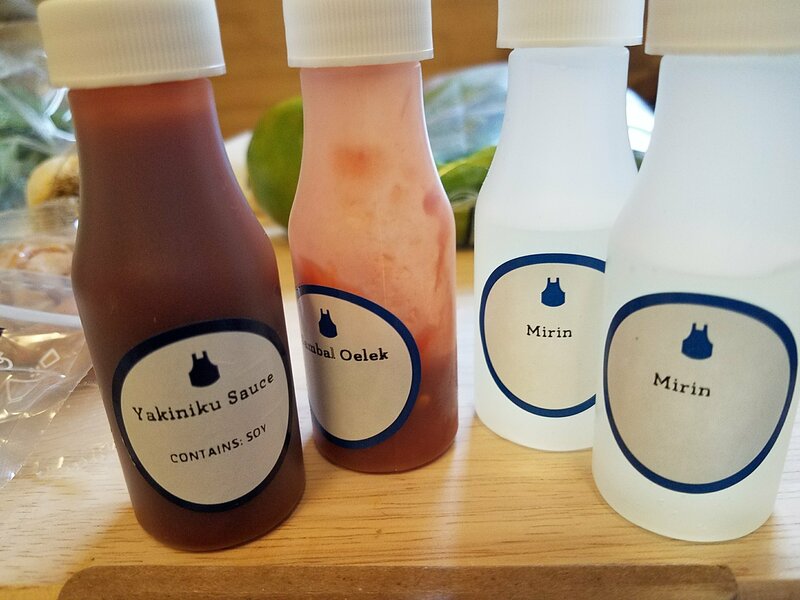 Thanks to my niece, Arispa, I received a free Blue Apron shipment. These are the ingredients for the first meal I tried. Note the adorable little packet of butter! After much anticipation, the Blue Apron box arrived around 3pm on Friday. I unpacked and took pictures, of course! The packaging is adorable, if not 100% effective. (More on this next time.) A couple of the cherry tomatoes went rogue and were squished among the rest of the contents. Large portions. 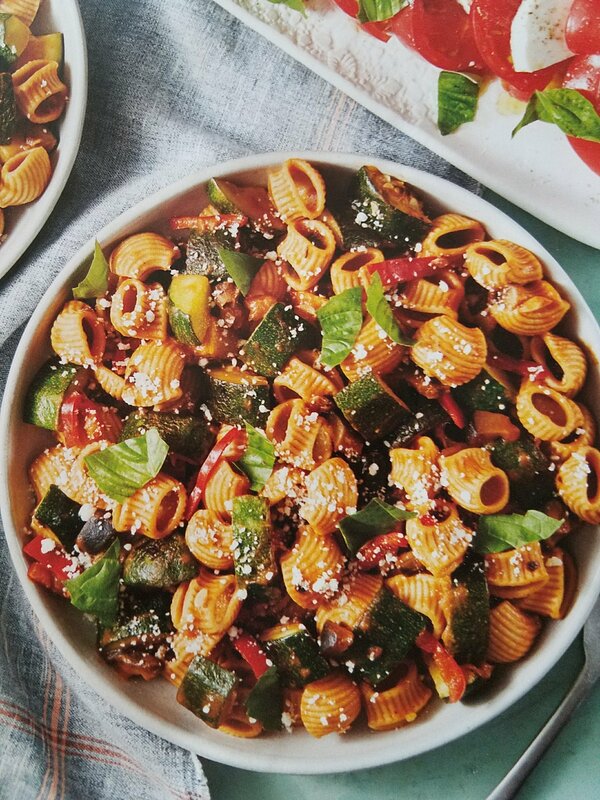 I’m okay with the difference except that there is more pasta to zucchini ratio in mine. 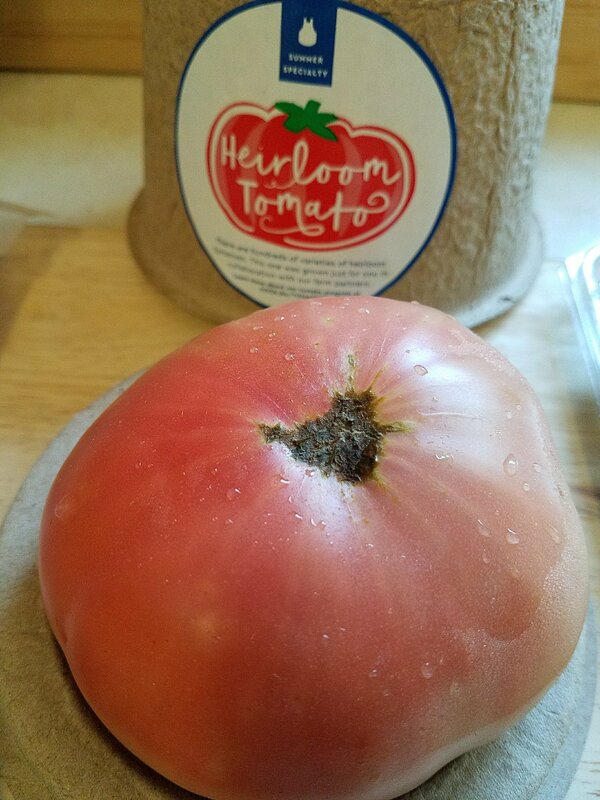 The heirloom tomato was big and traveled well, but it was far from ripe. Actually crunchy on the other! Decent meal. The salad was a nice touch. Lots of leftovers because thus doesn’t interest Hydra. Not sure of the value of having to put the olives, especially since they tasted like regular black olives. Is be willing to work harder for kalamatas! Hopefully, I’ll post about the other two meals soon. 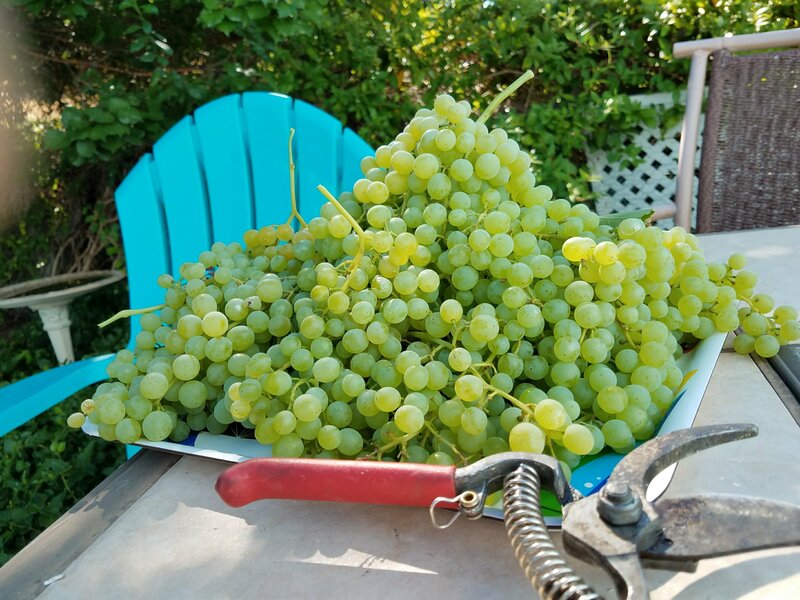 Must have picked 4 or 5 pounds of grapes from our vine today. Quite a nice surprise! There are about this many more waiting to ripen. 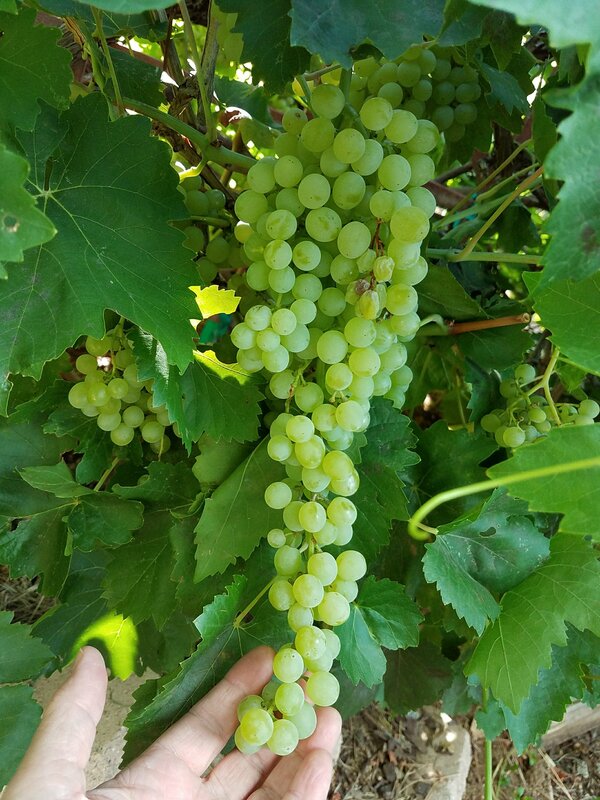 Just beautiful on the vine. Dodger gets a kick out of picking them off the stem. Perfect size for him he ate 8-10 in one sitting! Mom and I were sitting on the back deck the afternoon I arrived in Indiana. This pretty (homing?) pigeon watched us from the roof of the garage for a while. Then she came down to check us out, though she wasn’t interested in the black sunflower seeds we offered her. Mom says she looks like she was carved out of Ivory soap. And those red feet! After a while she swooped through the yard and away over the fields, hopefully toward home! My most recent acquisitions. All about the art. Thanks to LKD over at Gin & Lemonade – With a Twist for inadvertently giving me a really fun writing exercise for this lovely Saturday morning. You can read her elegant and funny list by clicking HERE. I don’t finish books that I’m not enjoying. This sometimes creates an embarrassing gap in my book list. I’ve kept a list of the books I read for probably three decades. I don’t usually give in to jealousy, but the green goblin squeezed my heart when I read about Pamela Paul’s My Life with Bob: Flawed Heroine Keeps Book of Books, Life Ensues. I will eventually have to read said book. I read most of my fiction in bed, and I sleep better since the Kindle Fire, as it turns itself off and I don’t end up with the lights on all night. Most of what I read is borrowed from the library. I assuage my guilt about this by buying hard copies of books I like as gifts, mostly for my mother. I make a conscious effort to buy books because I know that the library won’t have new books if we don’t support publishing. Plus I love authors. The subject matter of most of the physical books I’ve bought recently is art inspiration/instruction, travel, history, and writing. Literary historical fiction is my favorite. I love the way that I find parts of myself even in books that seem to be about people very different from me, like Cutting for Stone by Abraham Verghese. Years ago, I decided to read books by both men and women, but to mostly buy books by women. I don’t mind if you judge me for this. I usually have 2-3 books in progress. Or four. I love when a book sweeps me off my feet like a lover who knows how to dance. These books never last quite long enough. I spent a lot of the summer between eighth and ninth grade reading The Count of Monte Cristo while sitting in the arms of a huge tree, congratulating myself on the fact that I really enjoyed it. I still like reading outside, but I seldom do so. I don’t have reading snacks like Lorna does, but if I did it would be coffee and chocolate. Or tea and homemade shortbread. Or iced tea and orange slices. I wrote a book and an agent shopped it around, and I’m deeply ashamed at how much the rejection rocked my faith. I have written more than 50,000 words on three additional books, but have not finished them. This still brings tears to my eyes. I have filled more than 50 notebooks since I started journaling when I was 13 (same age as Anne Frank). I know that they are nobody’s treasures but my own. I still write. The first authors I followed were Marguerite Henry and Ray Bradbury. I get a big thrill out of adding a new book to Goodreads. My Mom taught me that with a some effort what you read in books can lead to what happens in real life. Okay, now tell me something bookish about you. Or make your own bookish list and post it on your blog or in the comments here. I’m also so very open to book recommendations. Pretty please? The planting instructions say that this Peace rose needs at least six hours of direct sunlight. I don’t think they had a Southern California heatwave in mind, though. It’s 105 in the shade in the back yard, so goodness knows how hot it is on the west side of the house this afternoon. My smart mother suggested this easy fix! I cut slits in an old busted up umbrella so the wind won’t catch it so easily and put it over the rose. Temperatures are supposed to rise over 100 degrees every day for the next week. Laying low on the edge of the desert. Thanks for following me to my new blog. Like the old blog, only more so. Get Any Given Sundry via email! It'll make your day go better!